J.D. Power completed its acquisition of NADA’s Used Car Guide today after receiving approval from U.S. regulators. No major changes are expected as the 82-year-old Used Car Guide moves under J.D. Power’s roof. 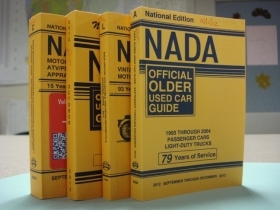 The NADA Used Car Guide will still serve its 100,000 subscribing clients. The companies also will continue to share data, combining NADA’s used-car analytics with J.D. Power’s Power Information Network, J.D. Power said in a statement today. Automotive News first reported on this deal in May. O’Neill declined to disclose terms of the deal. He said the guide will keep the NADA name for now, but that could change in the future. J.D. Power has extended job offers to all of the existing Used Car Guide employees in an effort to retain NADA’s expertise. Many of those employees have already accepted J.D. Power’s offer, O’Neill said.